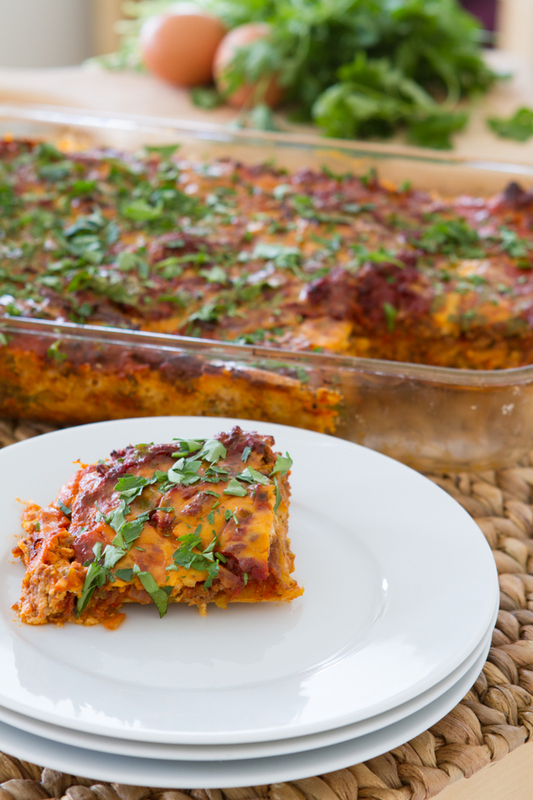 A dairy-free, grain-free, paleo lasagna recipe layered with butternut squash noodles and homemade, dairy-free melty cheese, made entirely of whole foods. Preheat oven to 350F and lightly oil a 9×13 baking dish with a dab of coconut oil or red palm oil. Set aside. Add regular ground beef to a large saucepan and brown on medium-heat until no longer pink. Add remaining sauce ingredients. Cover and bring to a boil. Reduce heat to simmer and cook for 30 minutes, to thicken. Meanwhile, slice butternut squash into thin pieces, lengthwise. They do not need to be perfect, just as thin as you can get them, about ?-inch. If they break while you’re cutting, no worries. Set aside. For the dairy-free melty cheese, heat ghee or tallow in a small saucepan over medium heat until melted. Whisk in the arrowroot. In a small bowl, combine almond milk, salt, lemon juice, garlic powder and onion powder. Slowly pour the almond milk mixture into the arrowroot mix, whisking to combine. Continue to whisk until smooth, then remove from the heat to cool for 15 minutes. Meanwhile, whisk eggs in a small bowl. Once the saucepan mix has cooled, whisk in eggs, slowly. Adding the eggs will make the mix thinner. Do not worry! The sauce will thicken up when it’s baked. Now, time to layer your lasagna! From the bottom, up: meat sauce, noodles, meat sauce, parsley, cheese, noodles, meat sauce, parsley, cheese. Place in the preheated oven and bake for 1 hour + 20 minutes, or until the cheese has set and the ends of the dish begin to crisp up. Almond Milk: I have not tried making this recipe with any other milk. The reason I chose almond milk is because of its mild flavor and light sweetness, very similar to regular milk. You could try homemade sunflower seed milk or rice milk. 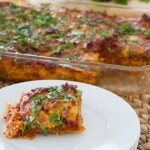 Butternut Squash Lasagna Noodles: total weight of completed, sliced noodles were 500 grams. Ghee or Tallow: Ghee is clarified butter, butter that’s had the casein and lactose removed from it. However, it still contains whey. If you are allergic to dairy, ghee should not be consumed. But, this recipe works fabulous with grass-fed tallow. You can render your own, or purchase at a health food store. Get grass-fed tallow here. Coconut oil could likely be used, but I haven’t tried it.